Earlier we made fun of Bing for going “dark” today to save energy in a way that doesn’t at all save energy. But Foursquare has an actual way to do that: take down the entire service. Yesterday, Foursquare had some downtime. That’s nothing new, startups have downtime all the time — see: Twitter, that was their M.O. for about a year — but the reason for Foursquare’s appears to be a little humorous. While the site is back up and running now, it appears that Foursquare forgot to renew their domain name, which expired on March 25. As a result, GoDaddy, the registrar, pulled the site and put up their own landing page. Which some people noticed on Twitter and other tipped us about. 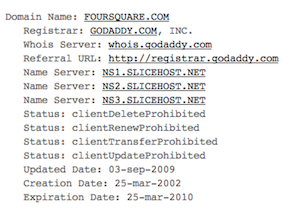 Luckily for Foursquare, registrars like GoDaddy tend to give you several notices before they pull down your domain and actually put it back up for sale. It looks like Foursquare was able to grab it quickly and get it back up there. Still, this seems like a rather large oversight from a company supposedly raising a new $10 million round of funding that would put its valuation near $80 million on paper. Let’s hope some of that money goes toward a new position: master of the domain. 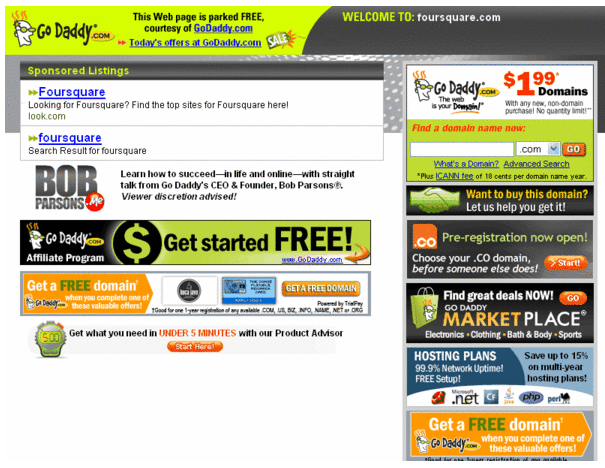 Interestingly, after its first round of funding, the first thing Foursquare did was purchase the foursquare.com domain. Previously, the service was found at playfoursquare.com. So what happened here is probably that the team forgot to change the email notifications from whoever owned the domain originally to one of their email addresses. At least, I hope that’s what happened. Also worth noting: co-founder Dennis Crowley originally wanted to name his first startup Foursquare, but couldn’t obtain the domain, so he went with Dodgeball instead (which later sold to Google). You’d think that Crowley would at least cherish the domain a bit more.